The Concept of “One Person Company” or OPC is a new term introduced in India but it is a very successful form of business in US, UK and several European countries since long back. The concept of OPC was first recommended by the expert committee of Dr. JJ Irani on 31st May 2005. 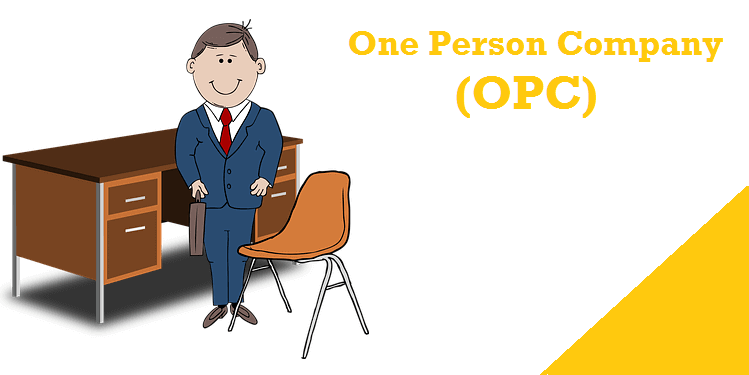 This new concept of ‘One Person Company’ (OPC) Introduced by the Companies Act, 2013. Introduction of OPC in India was a good initiative by Indian Govt. It opens the door for everyone to pursue his dream to become a sole entrepreneur. OPC is giving the sole owner or young businessman all benefits of a private limited company. Credit, Bank Loans, Limited Liability, Separate Legal Entity Status, Legal protection for business, etc. Shareholder & Director will be the same person. We are jotting down here few important points on OPC. Like who can form OPC in India? What are the salient features of OPC which every aspiring entrepreneur must know. 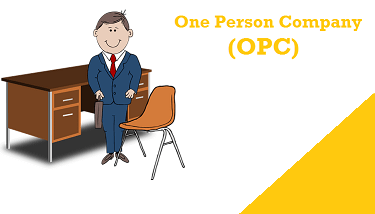 Eligible person to form One Person Company (OPC). Only a natural person who is an Indian citizen and resident in India can form a one person company in India.OPC is incorporated as a private limited company. Letters ‘OPC’ to be suffixed with the name of One Person Companies to distinguish it from other companies. Foreigner or non resident not eligible to form an OPC. Non-resident Indians or Foreign citizens cannot form a One person company. Only a natural person who is an Indian citizen and resident in India can form a OPC in India. One Person Company must have minimum one director. It may have more than one director. However, as per the Companies Act, the total number of directors shall not be more than 15. The One Person Company (OPC) has to nominate a Nominee with his/her written consent who, in the event of death or inability to contract of the owner of the One Person Company, shall take over the business of one Person Company. Only resident Indian and citizen of India can be nominated or become nominee in an OPC. One person cannot incorporate more than one OPC or become nominee in more than one OPC. Further if the person so nominated becomes the member of such a One Person Company and is already a member of another One Person Company, at the same time, by virtue of rules has to decide within 180 days (6 months) which OPC he has to continue. The member can change the nominee at any point of time. OPC cannot carry business of Non-Banking Financial Investment activity including investment in securities of any body corporate. 1. OPC cannot be incorporated or converted into a company under section 8 Company of the Companies Act, 2013. 2. No OPC can convert voluntarily into any kind of company unless 2 years have expired from the date of incorporation, except in cases where capital (50 Lacs) or turnover threshold limits (2 Crore) are reached. 3. Thus, OPC would lose its status if paid up capital exceeds Rs. 50 lakhs or average annual turnover is more than 2 crores in three immediate preceding consecutive years. If You want any assistance or guidance to register your OPC or One Person Company in India, contact us at our 24X7 helpline number (+91 95408 11400) or Whatsapp at +91 97179 91913. Take expert guidance and assistance for any business startups or formation in India. BIZINDIGO team is here to help you to get your business incorporated, running.